T/O East Wretham 0024 - target Aachen, Germany. Shot down by a night fighter and crashed near Grevillers in the Pas-de-Calais some 3km WNW of Bapaume, France. 374 aircraft - 214 Halifaxes, 76 Wellingtons, 55 Stirlings, 18 Lancasters, 11 Mosquitos ordered to Aachen. 2 Oboe Mosquitos carried out a diversion for the Aachen raid by dropping target indicators over Cologne. 20 aircraft - 15 Halifaxes, 2 Lancasters, 2 Wellingtons, 1 Stirling - lost, 5.3 per cent of the force. Source: nationalarchives.gov.uk - Bomber Command - Campaign Diary July 1943. Age: - POW No 1778 Stalag Luft Sagan and Belaria. +1988 California. Son of John and Harriet E. Jones, of Morfa, Llamlelly, Carmarthenshire. Grevillers British Cemetery, Departement Pas-de-Calais, France - grave 18. E. 25. Grevillers British Cemetery, Departement Pas-de-Calais, France - grave 18. E. 26. Source: CWGC - photo and more info Aircrew Remebered courtesy W/Cdr. Chester Armstrong, son. Son of Arthur and Margaret Williams, of Bolton, Lancashire. Husband of Nellie Williams, of Bolton. Grevillers British Cemetery, Departement Pas-de-Calais, France - joint grave 18. E. 21-22. Son of Thomas Frederick and Ada Yates, of Hampstead, London. 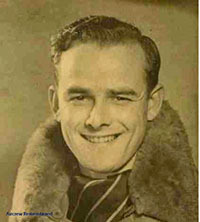 Husband of Enid Yates, of Hampstead. Grevillers British Cemetery, Departement Pas-de-Calais, France - grave 18. E. 24. Son of George James Newton and Mabel Frances Newton, of Beckenham, Kent. Grevillers British Cemetery, Departement Pas-de-Calais, France - grave 18. E. 23.